With the best hatch of the season fast approaching, I thought it might be helpful for some of the “Newbie’s” to post a few words on the Sulphur Hatch to get them off to a flying start this month… so if anyone has anything to add in the way of tips, tricks, details, etc. PLEASE feel free to chime in! The months of May and June here in southeastern PA bring forth the greatest event of the fly-fishing season… the SULPHUR HATCH. These yellowish mayflies are actually made up of three (3) different mayfly species; Ephemerella rotunda, E. invaria, and E. dorothea. Most streams in SEPA hold all three (3) species which can be good AND bad. It’s good because it extends the sulphur hatch from 1st/2nd week of May through much of June (most seasons)… and it’s bad because there are subtleties that the fish notice and key on (sometimes) and if the angler does not adjust, he (or she) could be in for a long evening. The good news though, is that the “bad” is well within your control. • Ephemerella dorothea: Duns have a pale yellow body color … best imitated with a size 16 hook (sometimes 18)… often hatch out of slower pools… hatching usually begins in last week of May and lasting well into June… hatch most often in evenings (7-8:30 pm), sometimes right at dusk in a quick “blizzard” of activity. Believe it or not, there are other “yellow” mayflies hatching during these same times as well, but those listed above make up the Sulphur Hatch as most anglers know it. As you can see there are differences between the three and it will save your sanity to have the proper sizes/colors to cover the gamut. At the very least I would carry size 14 dry fly’s in sulphur yellow to cover the rotunda/invaria and size 16 pale yellow imitations to cover the dorothea (some anglers use a Light Cahill for this). 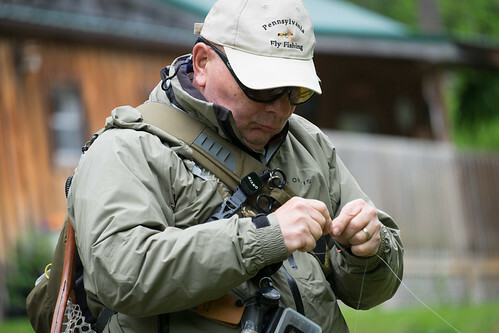 To compound the mayhem, in addition to the over-lapping hatch activity, trout will often key on a certain “stage” of emergence from drifting nymphs, to struggling emergers, to floating duns… and just when you think you have THAT all figured out, there could be spent spinners on the water as well! 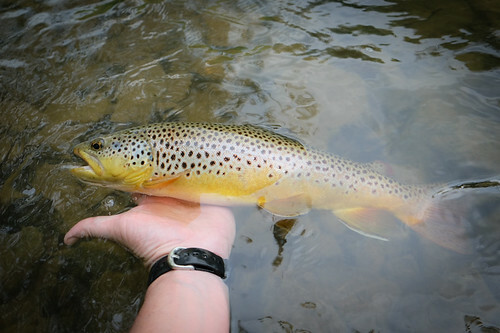 If you show up to the stream in the mid afternoon and no fish are rising and no insects are on the water (or in the air)… you could be in for some fast action by tying on a Pheasant-tail nymph (size 14-16) and fishing the riffles and runs. Prior to emergence these nymphs will fill the water column as they struggle to reach the surface. Trout will be gorging on them and you will often see flashes in the stream as fish slash from side-to-side engulfing drifting nymphs by the mouthful. Once a good supply of duns are on the surface the trout will come up for them and the real fun begins with dry flies… fish staging in faster water will be easier targets as they have precious little time to inspect your offering. 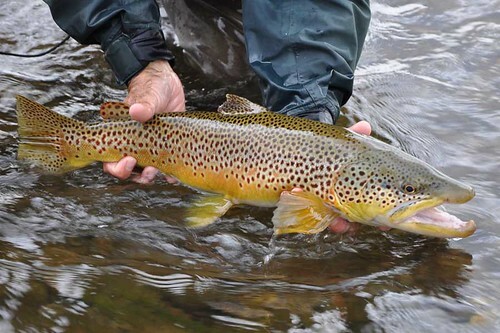 Trout holding in slower pools will be a bit tougher, but may be larger and you should still dupe them easily with a stealthy “down & across” approach. If the fish refuse your floating dry, try tying an emerger pattern or weightless nymph about 6” off the back of the dry. This will take fish that are targeting these hapless naturals. Some of you may have heard people say that the trout are easier to catch at the beginning of the sulphur hatch but get smarter as the weeks wear on? These are the guys that don’t adjust to the dorothea activity and are missing out big time. The difference in a size 16 or 14 hook may not sound like much, but place the fly’s next to each other and you will see why the trout key on one or the other. Just pay attention to what is on the water and you’ll be OK. The last piece of the puzzle is the spinnerfall. Again, this can be as frustrating or as rewarding as you want to make it. Personally I take my largest “dry fly caught” trout every season during the spinnerfall. It’s an easy meal and one that large trout rarely pass up. As you survey the stream take notice of the presence of any swarms of “dancing” mayflies over the riffles. These will be egg-laden females preparing to drop their cargo into the drink before dying and dropping in themselves. The males in all likelihood have already fallen, spent from mating activity. During sulphur season this activity most often takes place during the early evening if not right at dark (maybe early morning if air temp’s are too high for mating flights). These mating swarms start out high above the stream surface and if you happen to notice flocks of insect-eating birds (swallows, swifts, nighthawks… maybe bats) high above, you can be pretty sure that a spinnerfall is about an hour away. Sounds complicated but it is surprisingly simple… for this activity I carry just one fly—The Rusty Spinner—in sizes 14-18. Look for subtle risers, often times near the tail ends of pools, just “dimpling’ the surface and float your imitation right down into the waiting jaws of a heavy brown. If rising fish continue to ignore your floating dun, tie on a Rusty Spinner and 9 out of 10 times you will be surprised at the response. 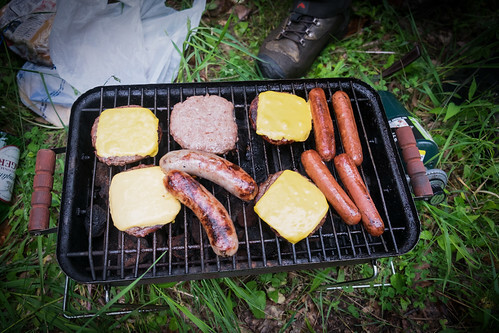 Always keep in mind that ANY and ALL of the above described activities could be going on… sometimes simultaneously! Just be observant, let the trout tell you what they want, and you will enjoy your cigar and cold beverage a LOT more back at the parking area… this I promise. *NOTE* The referenced taxon above is a bit outdated as the society of entomologists (or whoever they are) have decided that E. invaria and E. rotunda are now the same species (E. invaria)… also they have added a second dorothea to E. dorothea (E. dorothea dorothea). This info is strictly for the angler’s that are over-obsessed with details (like ME for example)… the trout still eat them the same as they always have. 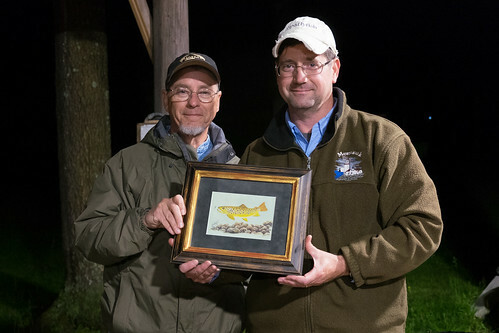 Friday, May 18th is the start of our annual gathering for the Paflyfish Spring Jamboree Weekend. 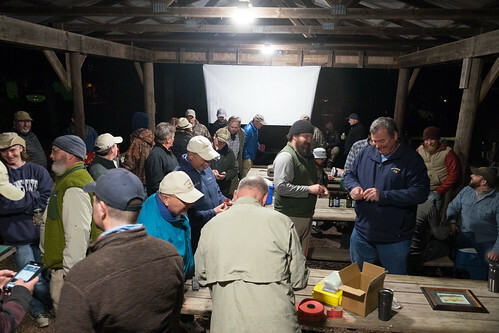 This is our annual meet-up for members of the site to get together to fly fish, tie flies, camp and share a few stories. 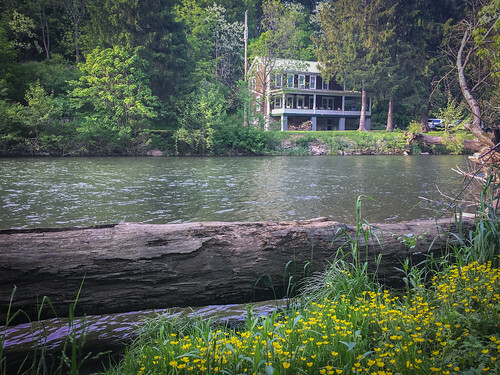 We have a lot of fun fishing over some of Pennsylvania's finest streams including the Little J, Penns Creek, Spring Creek, Fishing Creek and plenty more in the region. 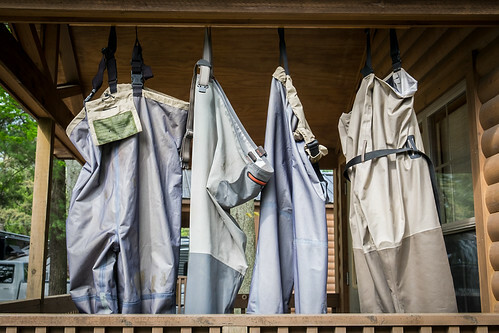 Fly fishing during the winter can be an enjoyable endeavor if you put some effort into finding where the wily trout feed during the cold water temperatures. An important “hatch” in winter is that of the early black and brown stoneflies. 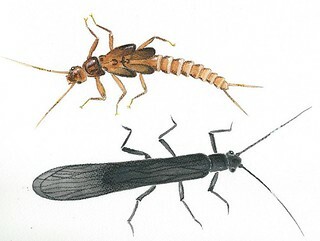 Stoneflies both little and large are the canary in the coal mine for water quality. They are one of the first species to disappear on impaired streams. They thrive as nymphs in highly oxygenated fast moving waters like rapids or heavy riffles and often where the thick moss grows on the rocks. I presume this helps them keep their footing while foraging on the bottom in the fast water. This is where I always find them and where I look for them to be effective when fishing larger freestone streams. Limestone spring creeks are slow moving with low gradient and few if any riffles over their short length. This is why you don’t see them in great numbers there. Larger freestone streams are more likely to get too warm in summer and are not great fall or winter trout streams, unless they receive a fall stocking or have a limestone spring influence (i.e. Penns Creek). So where you find little black stonefly "hatches" to be prolific you likely are not fishing because they are mainly stocked trout streams. And few are stocked in fall or winter after the summer "trout drought." Their onstream behavior is an egg laying, more than a mating ritual or traditional hatch. That's why they are seen as solitary, usually downstream and across courses where the fly daps the water or skitters. If you observe their behavior and how the fish take them it’s pretty easy to mimmick but it is not a typical mayfly behavior to be sure. But it is similar to caddis fly egg laying. This hatch is more like fishing a streamer or a wetfly that doesn't sink. I really enjoy this hatch and fish it with a #16 black bodied Henryville special with a Z-lon wing. Sometimes I trail a black bodied soft hackle on a dead drift while waiting for the initial reaction strike and then I slowly lift and drop the rod tip as the fly swings across the slower waters where the stoneflies lay their eggs. Most of the strikes come on the swing to be sure. If you see half a dozen at a time in the air and hitting the water at a time during a still, sunny period of the day, you've hit it right. There are several stonefly species that hatch in the winter/early spring. The tiny winter black / snowflies, aka needle flies that are smaller and hatch in the middle of winter are a good example. You can often see them crawling on the banks in the snow. Usually a little later in the winter to early spring, the early brown and black stoneflies hatch. They are a little larger. I have had little success fishing the tiny winter blacks vs the early brown and black (nymph or dry). The main reason, in my opinion, is the lower water temps in mid winter vs. late winter when the days are longer and temps warmer. But to be sure, often the best results come on sunny, snowy days with temps above 45 degrees, regardless of the water temp. So find a big freestone stream with a fall/winter stocking of brown trout (more likely to rise) and on a warm sunny day in the winter/late winter, January through March. Swing ‘em if ya got ‘em. WEATHER: Blue bird skies with highs in the 70s. WATER: 3.2' at the Harrisburg gauge, gin clear, 60 degrees. A few boaters and yakkers but not a lot of activity. HATCHES ETC: Nothing significant. A few scattered bugs, no rises; large schools of small minnows around 2" in length around shoreline areas. No crayfish seen. One bass caught in a riffle today had multiple caddis larva in his mouth and gullet. These caddis were dark colored and about #16. Teamed up with Afishinado today to put some autumn hurtin on the Susky bass. We arrived at mid day about 11am and fished until 5:30pm. It was a tough day. The bright sun and very clear water seemed to have the river switched off. We fished some very good sections with little success. Around 4pm, with the sun lower in the sky and softened by haze, the river seemed to wake up. We found active fish in fast water, mostly along current seams but also in shallow riffles. I had expected to find SMBs around ledge rock and and deeper tailouts today, but these spots didn't produce. The active fish were in pretty fast water. Had luck high sticking a helgy nymph and swinging a Clouser. I tried poppers briefly with no success. I managed about eight fish with three in the mid teens. Afish got fifteen bass with one at 18 inches. A very nice day to be outside, but fishing was sub-par for what I'd expect on the big river in October. Nevertheless, with water levels still quite low, if you're a wading angler, the Susky is in great shape for FFing right now. Members can follow along with comments in the forum here. September in the greater Yellowstone region is quickly becoming one of the most popular times to visit and fish. 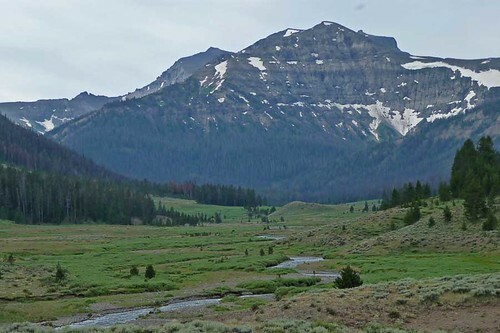 September is a great time to fish Yellowstone National Park because water temperatures are dropping into the optimal range and trout feel the urge to pack on the pounds for the upcoming winter. Weather in September is usually very pleasant with cool, crisp mornings and warm afternoons. 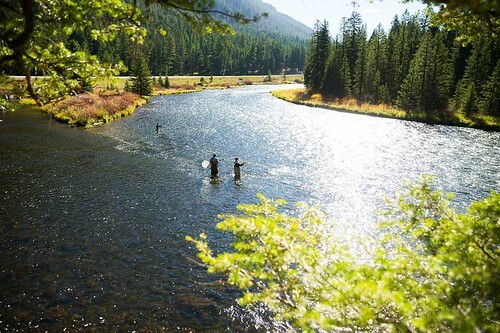 September is the only month of the year when literally every river in the Park is fishable. The Madison drainage has cooled enough for productive fishing but the high country streams are still warm enough for fish to be active. Throw in a few bugling elk and some fall colors and you have the recipe for a great trip. Let’s take a look at some of the highlights of September fishing in the park. 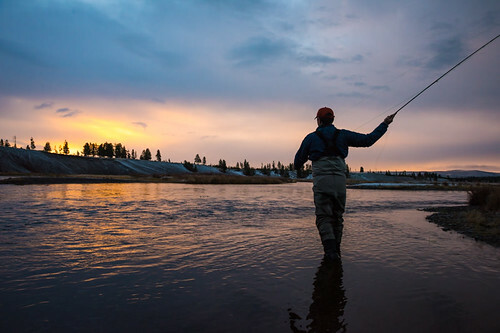 As the weather cools, the Firehole once again becomes a viable option for fishing. At the beginning of the month, it may only be cool enough to fish in the mornings, but by the middle of September it should fish well all day. The main attraction during September is the White Miller Caddis, which typically emerges from mid morning until early afternoon. On cloudy days, especially towards the end of September, Blue Winged Olives emerge in the middle of the day. When no hatch is present, swing soft hackles through the riffles. I prefer drab, generic flies like a soft hackle pheasant tail or hare’s ear. In the fall, primarily due to low water, the fish in a Firehole can be a bit pickier than they were in June. Downsize your tackle a bit and take care not to spook fish with your movements. The main attraction on the Madison River in Yellowstone Park in the fall is the run of fish out of Hebgen Lake. While this run peaks in October and November, there will usually be some fish in the system in the latter part of September. The best way to target these fish is by nymphing or by swinging a streamer in a down and across fashion. No matter the technique, the key to catching these fish is locating where they are holding. These fish are used to a lake environment, so look for deeper, slower water. When nymphing, I prefer a stonefly nymph as my lead fly and small, nondescript mayfly pattern as my dropper. If I am swinging a streamer, I like the intruder style patterns that are popular with steelhead fishermen. Fall fishing in the Lamar Valley can be challenging due to low water and the cumulative effect of fishing pressure throughout the summer. On sunny, warm days turn to small terrestrials like ants or micro hoppers. On cloudy days, especially towards the end of the month, look for mayfly hatches of Blue Winged Olives or Tan Drakes. Plan on fishing a 5x leader that is a few feet longer than your standard 9ft length. The Yellowstone River inside the park is a nice option in September as it falls off the radar for many once the famous stonefly hatches have ended. The river hosts an excellent Blue Winged Olive hatch, especially on cloudy days and towards the latter part of the month. Hopper patterns and attractors will still be your bread and butter for much of the month. September is a good time to start working in mayfly style attractors such as a purple haze or parachute adams as the fish may be a bit more selective than they were in July and August. 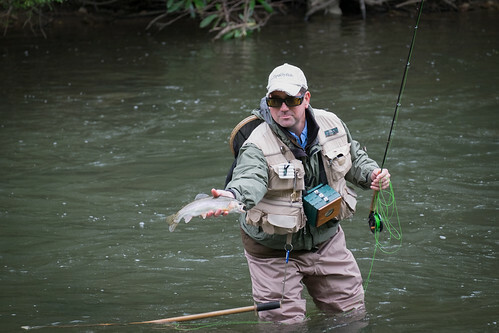 A small streamer will fill the void if the dry fly bite slows. The entire Gardner River should fish well in September, as the section below the Boiling River will have cooled sufficiently for all day fishing. In the early mornings, I like to nymph fish with a stonefly trailed by a attractor pattern like a prince or copper john. As the day heats up, small hoppers and various attractor patterns are your go to. Cloudy days will see hatches of Blue Winged Olives. Remember that the Boiling River essentially creates two separate rivers. Fall mayfly hatches will appear above in the cooler water first while hopper and attractor fishing will hold on longer in the warmer waters below. 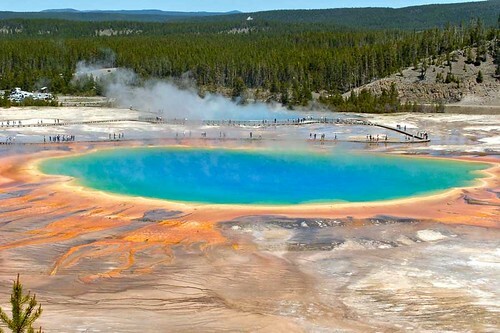 During the fall, keep in mind that there is always the possibility of a surprise up from the Yellowstone. Fall fishing is truly one of our favorite windows for both Montana and Yellowstone National Park. Cool mornings and warm afternoons often produce the perfect blend of ideal water temperatures coupled with fall hatches and late season terrestrial fishing. The general family vacation season has slowed dramatically leaving the park to more serious anglers. 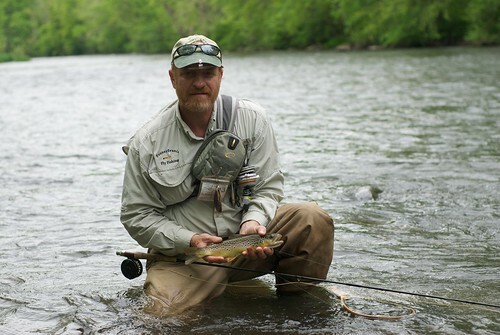 Brian McGeehan is a Pennsylvania native and has been guiding Western rivers in Montana, Wyoming and Colorado for 19 seasons. He is a licensed Montana outfitter and owner of Montana Angler Fly Fishing based in Bozeman, MT. I went out with Tom Ciannilli on Friday evening to my favorite place on the the Little J. Great night and a classic May Sulphur hatch at about 8:00 pm to close the evening. Saturday Dave, Maurice, Tom, Mick and I went over to Penns. A big change in the weather with a cold front dropping the temps into the 50's and some light rain in the morning. Dave showing off with catching a nice bow on his first cast in the Class A section of Penns. 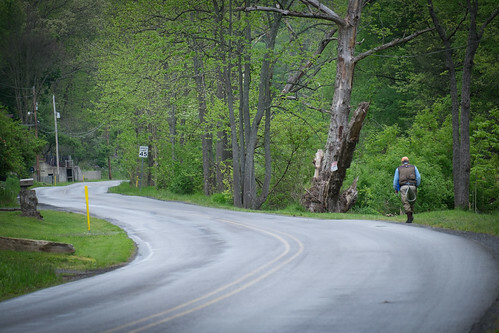 The long and winding trail to fly fish. Tom looking kinda serious about his fly. 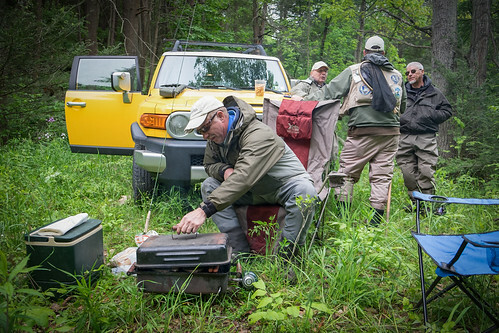 We move off the Class A Section and Maurice pulls together another one of his masterful fly fishing tailgating experiences. Yeah that is pretty damn good when you've been standing in cold water all day. 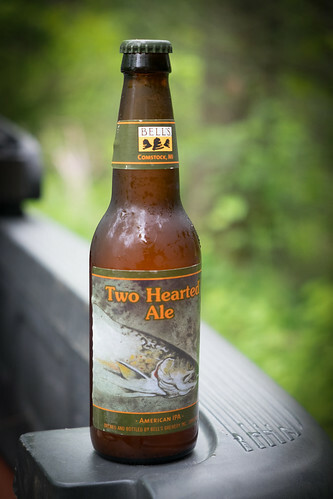 Of course we had an IPA with a trout on it. The bonus was it was 14 proof. GenCon, Don Thompson, Paparise (Phil, +2), Captain Hook Bearfish, (Rookie) (Dave), Bopper (Tom) Skybay (Jared), and Shakey!! My own personal team of rivals: Jack, Maurice, Dave Kile, Tom, and Dave. The best moderators on the Internet and why we have the community we do!! Thanks guys for all your help. 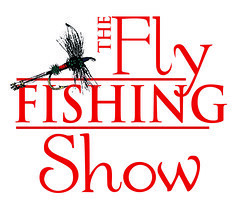 Friday, May 19th is the start of our annual gathering for the Paflyfish Spring Jamboree Weekend. 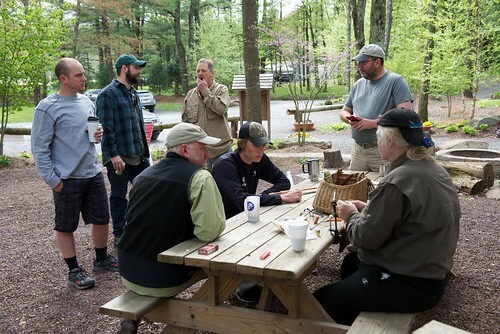 This is our annual meet-up for members of the site to get together to fly fish, tie flies, camp and share a few stories. 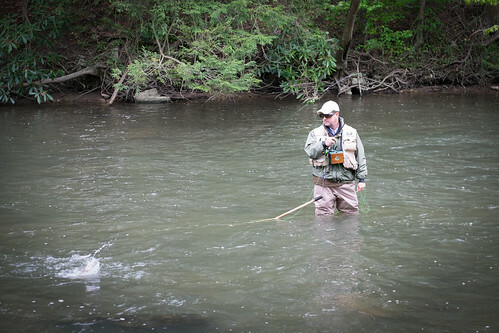 We have a lot of fun fishing over some of Pennsylvania's finest streams including the Little J, Penns Creek, Spring Creek, Fishing Creek and plenty more in the region. This year we are going to make the weekend at little more informal. At this time we are not going going to be planning any special speakers or activities. 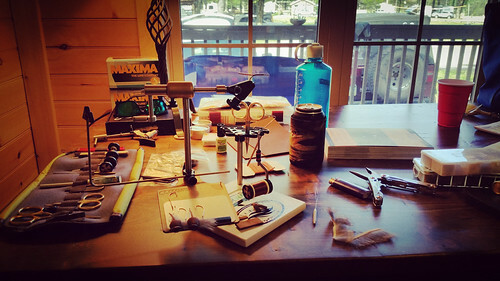 There is always plenty of impromptu fly tying, casting lessons and support on where to fish. So if you are unsure about the area, do not worry there are plenty of members from the site that can help get you started. Many anglers from the site come up early or stay later after the weekend. Follow the latest details in the forum here.